Show Your Support for Olivier and Look Cool at the Same Time! Click Here to Buy a Tee-Shirt and Help Support Olivier at our New Cafe Press Store! 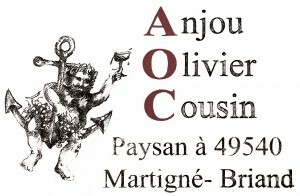 Olivier Cousin is fighting against big business right now. The Inter Loire and the AOC system are unfortunately in the pocket of industrial farming operations, as you can read in his letter. They’ve polluted his land, co-opted the small wineries in his town, and now they want to take away his livelihood for protesting the changes. We’ve had a tremendous show of support so far by people signing our petition, and the petition on glouegoule.fr in France. But we’re worried that this may not be enough, and that money may be called for. If you’d like to show your support for Olivier we set up this merchandise store to give you that opportunity. The AOC sees Olivier’s joke (pictured above) as a threat to their system, and we agree. They’d like this joke to be silenced, so we thought what better way to fight against this attempted repression, than to immortalize and flaunt the design everywhere? We slapped the design on tee-shirts, hoodies, water bottles, and tote bags, so you don’t have to spend a single waking moment not showing your support for Olivier. 100 % of the profits on the sale of these items goes to help Olivier fight the fight. If need be, it will be used to help pay the 36,000 Euro fine they are threatening him with. We personally can’t wait to try our tee-shirts on! So head on over to the cafepress.com store, and if you haven’t done it yet, please sign our petition! For a recap of everything that’s happened, check out our Roundup of Coverage on Olivier’s Fight.